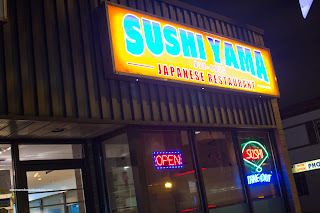 We were not really planning on revisiting Sushiyama after Friday night hockey, but it acted as a backup plan to our original destination. After our visit to Hime a while back, Emilicious and I were intrigued with Rhizome Cafe next door. It had this eclectic feel which seemed quite inviting. However, as we walked up to the place this time around, there was this book reading of some sort and there were no tables available. Everyone there seemed so focused on the reading, we really didn't want to walk in and interrupt. So we ended up walking down the block to Sushiyama. As per usual, there was a lineup and since we had 9 people with us, that was no easy task to find a table that large. Well, there was one in the corner near the entrance, however, the people there took their time leaving even though they had already paid their bill. In fact, it was about 20 minutes before they left. During this time, Boss Woman was getting really impatient and even suggested we go next door for some Pho. And she doesn't even like Pho! LOL... In the end we got our table and most people decided to get their own things. I was, however, able to convince Sweet Tooth and Milhouse into sharing food with me (they even left the ordering to me! bad idea on their part...). 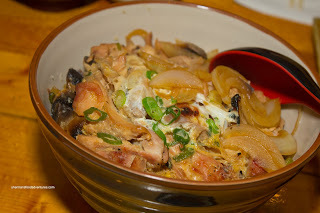 As for the others, Emilicious had the Charashi Don. It was a fairly large bowl of rice with plenty of fresh-looking sashimi on top. Nice colour and sheen. It was a good value at just a shade under $10.00. However, I discovered later that she got food poisoning afterwards (was it food contamination? Make what you want from that information). The ever elusive Polka King decided to join us this time for eats and brought along Polka Dot. Seems like he's allowed to come out when she can keep an eye on him... I guess the expression ball-and-chain really does apply to some people... They decided to have a Party A Tray all to themselves. It sounded like a lot of food, but in reality, it was only 9 pieces of nigiri and 24 pieces of maki sushi. They easily finished it. Again, for $19.00, it was a pretty good value. They weren't exactly descriptive when I asked how they liked it, but not to worry since I had ordered some sushi to share (btw, they did like it). Milhouse, Sweet Tooth and I started with the Alaska Roll consisting of 2 types of salmon, tuna, tako, crab stick, cucumber and tobiko. 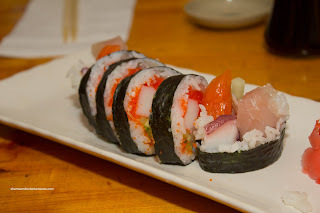 This was an ingredient-heavy roll which was quite good. I found the rice to be somewhat dry, but it was still alright. 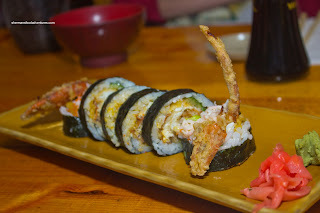 Normally, a Spider Roll (soft-shell crab roll) can run you roughly $8.00 (if you are lucky) at most other sushi joints. When we noticed that it was only $6.75, we thought it was a great value. Now price and taste can be 2 mutually exclusive entities... Fortunately, this was a well-made roll with a meaty soft-shell crab which was not slathered with too much batter. 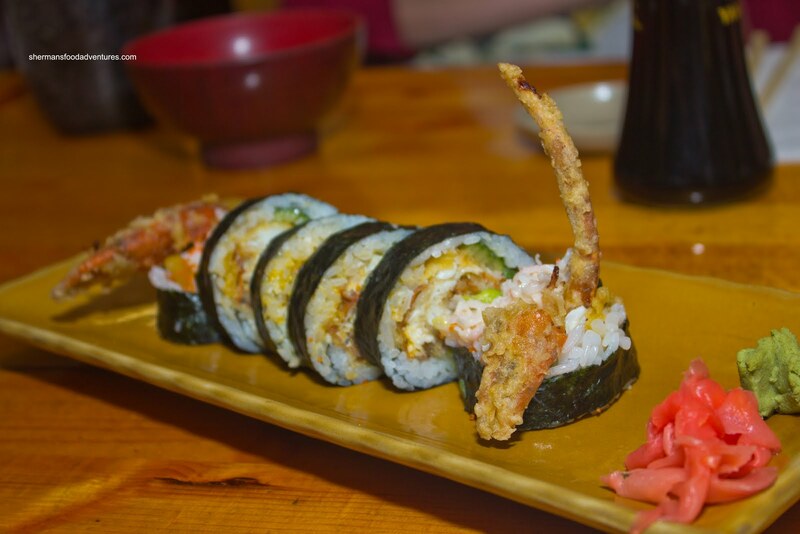 Too many places put more batter to make their soft-shell crab look bigger. 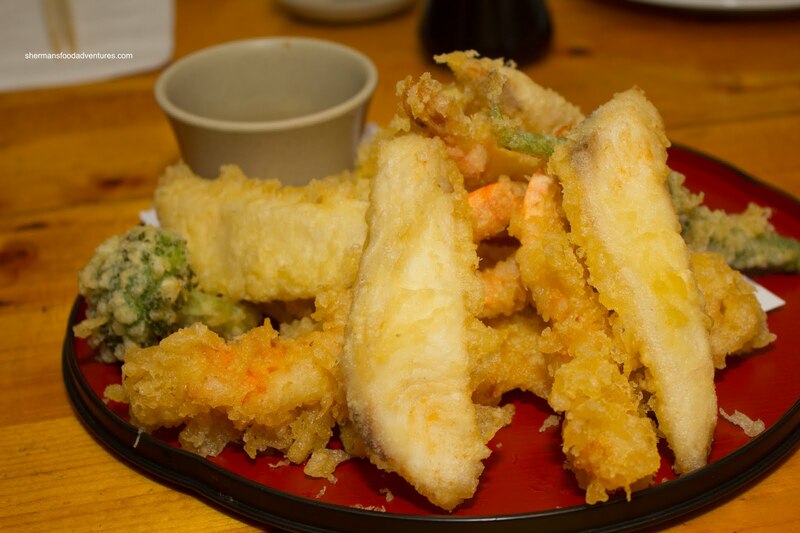 On the topic of deep-fried, we also shared the Deluxe Assorted Tempura. Normally, when there is fish tempura, the pieces are roughly the size of a fish stick. Not here, the first thing we noticed as the dish was being placed on the table was the large pieces of fried fish. Furthermore, the fish was only lightly coated with tempura batter. In fact, this was better than many fish 'n chips I've had. The fish was moist while the batter was crisp and light. Predictably, the rest of the items were fried perfectly crisp. For the purposes of filling our tummies after a hockey game, we got 2 filler items starting with the Oyako Don. I know, a rice bowl ain't too much to get excited about, but this was solid nonetheless. Lots of moist chicken with onions, egg and mushrooms. The rice had a nice texture where it was chewy while not dry. However, the most important thing of all was the mirin, soy and sugar mixture seeped all the way through the rice. The other filler or carb-heavy dish was the Yaki Udon. It was a tad on the greasier side. 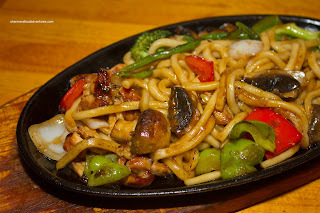 I guess they didn't want the noodles to stick to the hot cast iron plate. The texture of the noodles was good though being slightly chewy. Moreover, the veggies remained crisp. However, as the picture easily suggests, they skimped out on the udon. Although not expensive, this was fairly meager in portion size. 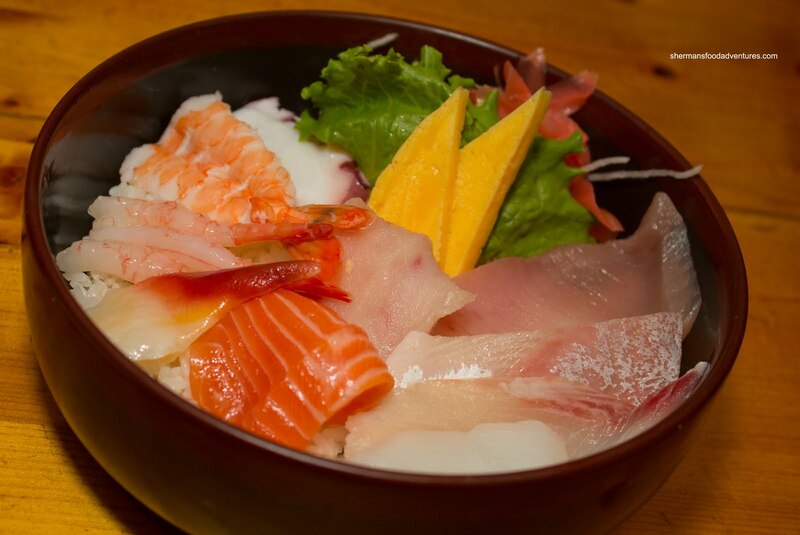 Other than that, Sushiyama generally represents good value with above average food. 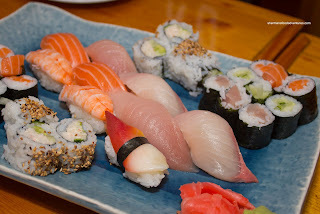 Not sure what happened with Emilicious' charashi, but my own personal experiences at Sushiyama have been solid. Not the best in town by a long shot, yet certainly better than most (at very reasonable prices too).